Rambla basically means a main street, usually with a wide pedestrian concourse down the middle of it. The most famous one is Las Ramblas in the heart of the old city, but other barris or neighborhoods also have ramblas and Poblenou is blessed with a rather fine one. You can reach it from La Diagonal and walk down it, although personally I prefer to approach it from the other end, which is how I first came upon it. 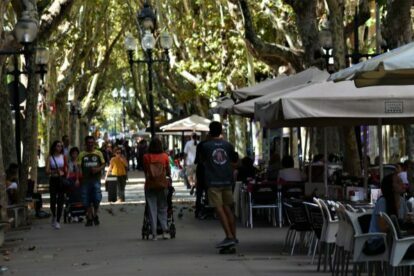 Ambling up from Bogatell beach, simply join the flow of pedestrians heading inland and you will find yourself under a canopy of tall plane trees and a second canopy of cafe umbrellas marking the outside tables of the many establishments along the rambla where you can rest up and grab a drink or a meal. Poblenou is now home to several large hotels so the venues are a mix of local spots and others that tend to serve standard tourist orientated menus, however the service is always correct and the outside seating spaces are plentiful and a great place to hang out both in the day or the evening when you can view the residents hit the streets to do their shopping or simply do the paseo and stroll or sit at the park benches placed all along it. To eat I recommend El 58 and Recasens; you may need to wait for a table as they are always popular, but hey – who’s in a hurry?